From the bestselling American young adult fiction author, Lisa Jane Smith, also known as L.J. Smith, comes the great book The Vampire Diaries: The Awakening. This novel is book one in The Vampire Diaries series, and it was the third book that Smith published. The book, which has been turned into a television series, is about a love triangle featuring two vampires and one human. However, it is anything but the typical vampire/human love story. Elena Gilbert is your average pretty, popular high school girl who gets whatever and whoever she wants. Stefan Salvatore is the average hot new guy that all the girls, including Elena, are drooling over. However, what no one knows is that Stefan is a vampire and that he has a vampire brother named Damon. Damon is the typical evil vampire, who kills humans for fun. Stefan on the other hand only kills animals, which makes him weaker than Damon. When Elena crosses path with Stefan, she is determined to do whatever it takes to become his girlfriend. However, Damon is always looming in the shadows making Stefan look bad, and he won’t stop until he gets Elena. I discovered the book The Vampire Diaries: The Awakening, last year when I went to Half Priced Books. I had just started watching the television series, and I thought that I should read the first book before I continued watching the show, and I’m glad I did. This book was great, and I absolutely loved it. However, there was one thing that I wish could be changed, and that would be the number of typos in the book. More than once I came across misspelled words or weirdly structured sentences. The typos didn’t take away from the story at all, but they were a little bit annoying. Also, some of the details in the book are different than the ones on the television show. I really wish that the show had stuck to the facts given in the book because it would’ve made reading the book less confusing in the beginning. Other than that, the book was really good. The Vampire Diaries: The Awakening, allows readers to get a glimpse of what the characters are actually supposed to be like, what it’s like to have two vampires be in love with a human, and I absolutely enjoyed it. The book kept my attention from start to finish, and I would recommend it to anyone. I absolutely enjoyed The Vampire Diaries: The Awakening and I can’t wait to read the next book in the series. If you like reading about vampires, drama, romance, and other supernatural things, then this is definitely the book to read. 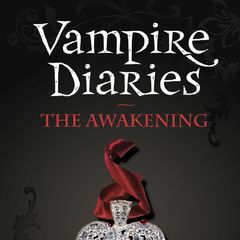 If you’re interested in purchasing The Vampire Diaries: the Awakening, it is available at Barnes and Noble or on Amazon.